I was so excited to play with this new set and here is my very first creation with it. 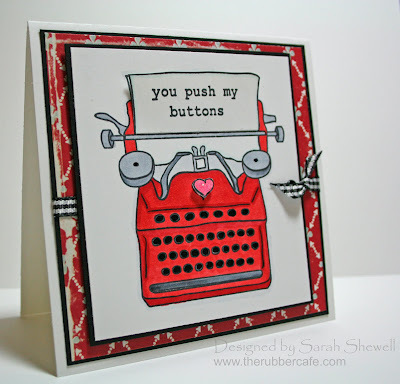 I just adore stamp sets with fun phrases you can mix and match...this fits the bill! To get a set of six stamps for just $13.50 is almost too good to be true...check out Just My Type. I started with stamping this typewriter image twice - one to color and one to use for cutting. I colored this with various copic markers and added a little shine to the keys with a black glaze pen from sakura. The fun part of this card was attaching the sheet of paper and popping up the outer edges to make it appear it's ready to be pulled of the machine. Inside I've written "in all the right ways" since it will be going to my hubbie for Valentines day. Have a fantastic weekend and thanks for looking! Designer Paper by Cosmo Cricket. Hey Sarah!! You know how much I adore this card. You really rocked this! !